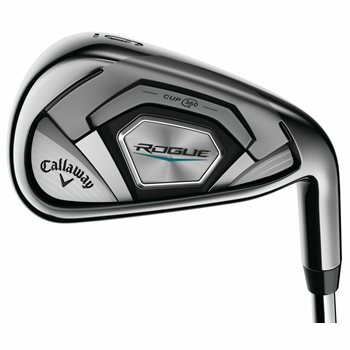 The Callaway Rogue Combo irons feature hybrids with Face Cup Technology and Jailbreak Technology that work together to promote fast ball speed across a larger part of the face for consistently long distance. The Rogue irons are long, accurate, easy to hit, and versatile with great sound and feel. The irons combine the renowned 360 Face Cup technology with Variable Face Thickness (VFT) technology to dramatically expand the portion of the face that delivers fast ball speed for distance on off-center hits. Tungsten weighting allows the CG in each of the long irons to be positioned with extraordinary precision, promoting optimum launch and control at each individual loft. The Rogue irons feature Urethane Microspheres to provide the sound and feel benefits of urethane without compromising COR or ball speed.